If you want to be ahead of the pack, you need to anticipate the next trend. The gaming and video/interactive worlds have immersive 3D environments, they need the sound to go with it. Trip’n Lab’s Sound Trajectory gives you the tools to set up any 3D Soundscape you can think of to satisfy their needs. 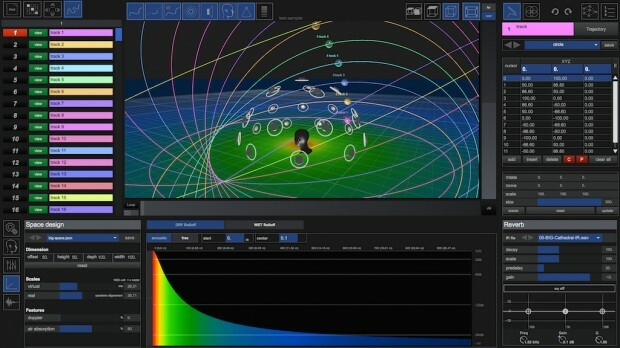 Sound Trajectory is a powerful plug-in designed for the new generation of sound creators to construct completely immersive soundscapes. It is the result of years of experience of creating 3D sound environments for electroacoustic music, live performance, cinema and interactive installations. The semi-modular design of this software makes it possible to adapt easily to the users’ needs for a specific project. For the studio or live work, it works either as a standalone application or connected to other multichannel audio and video solutions via their inputs and outputs. Its flexibility is one of its greatest strengths. Manage the positions and trajectories of your sound sources by drawing their path in a 3D space. Utilize an inbuilt sampler to play the audio samples along the trajectories, with 32 polyphonic voicesSampler, it can also trigger listed files in sequence. Mix 32 tracks with trajectories. Each track can support up to 16 input sources. Employ the Motion Listener to easily monitor a trajectory. With a simple line you can define the sound path using the 3D Visual interface you choose the position of the speakers, the sources and the listener. It’s an app which extends existing solutions like DAW, modular software, live mixing and game frameworks. Supports any multichannel speaker configuration for music studio, live concerts, cinema, Fulldome, VR and Binaural. From mono to Dolby Atmos® 9.1, a dedicated editor allows you to define the pattern of the sources. During the mixing, Sound Trajectory allows you to control their position, size, rotation, and scale. Visualize video from the integrated player or Syphon, Spout for all formats from standard, up to VR 360. Use OSC protocol assigning inputs and outputs in order to control Sound Trajectory from another software or to control other software remotely. Use Midi protocol with 14 bit pitch-bend to control the trajectories index. A session can have as many scenes as you want. Each scene allows you to instantly store and recall all the parameters that you have edited or modified. This entry was posted in DontCrack, Plug-ins, Promotions, Video and tagged 3D, 3D sound environments, Dolby Atmos, immersive sound, mutichannel sound, Sound Trajectory, Trip in Lab, virtual reality. Bookmark the permalink.